Thanjavur Brihadeeswara Temple: Thanjavur is "Rice bowl of Tamil Nadu" and a great pilgrim destination of South India. It was the capital of Chola kings who ruled the region during 9th to 13th centuries. Thanjavur is a flourishing centre for bronze sculpture and painting. 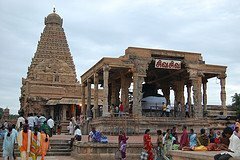 Among the many temples they built, the most important one isThanjavur Brihadeeswara Temple, built by Rajaraja Cholan, the Great Chola king. The temple, dedicated to Nandi, the Bull is a masterpiece of the captivating Chola architecture. The mount of Lord Shiva i.e. Nandi has been made from a single granite rock. The Temple, made over a 29 m square base, is surrounded by moat on two sides and Grand Anaicut river on the other side. The compound within its inner wall measures about 500 feet x 250 feet. The walls of the sanctum are adorned with the wall paintings of Chola and Nayak periods. The temple and has a soaring vimana and a stunted gopuram. The inner sanctum and the gopuram were constructed over a period of 12 years. It is the first granite temple in the world, constructed from a single piece of granite weighing around 80 tonnes. The bordering walls of the temple are decorated with the images of Nandi. Among the many other temples built by the Chola Kings, the temple at Gangaikondacholapuram is also very famous. Bragatheeswarar Temple,also known as Rajarajesvaram Temple, is the landmark of Thanjavur. Bragatheeswar temple is a great tourist destination. It is one of the few great Indian monuments listed in UNESCO's World Heritage list of historical sites and monuments.. The day of the Ruling star, satabhishag is treated as a festival day every month as it symbolizes the ruling star at the time of birth of Rajaraja. The annual festival is held for 9 days in the month of Visaka or May according to the English calender. The deity is bathed with the water soaked with the fragrant Champaka flower. Palace Building The Palace, situated near the temple, is a cluster of fabulous buildings built partly by Nayaks and partly by Marathas.The two towers - Kudagaparam and the Madamaligai are visible from all parts of the city. Art Gallery is housed in the Palace Building. The gallery has many bronze idols and works of art of the Chola period. The Saraswathi Mahal Library Also located in the Palace, the Library is renowned for its compilation of manuscripts on paper and palm leaves in several Indian and European languages. Sangitha Mahal This monument was built by Raja Sarfoji. It is also called as the Mansion of Music, and a fine auditorium. Many other temples like Thiruvaiyaru (13 kms away), Thirukandiyur (10 kms away), Karundhittangadi Temple (2 kms away), Kalyanapuram (8 kms away),Pullaimangal (16 kms away), Poovanoor (38 kms away), Kuthanur (20 kms away), Thiruppugalur (30 kms away), Thirukannamangai (35 kms away), Thiruvarur (55 kms away) and Manora (65 kms away). Excellent lodges are there. Also Rest Houses provided by the Tourism Department. These hotels are reviewed by Trip Advisor visitors. Thanjavur hotels by Hotels Combined. By Air: The nearest airport is situated at Trichy, 65-km from Thanjavur. By Rail: The nearest railway station at Thanjavur, is well connected with Trichy, Chennai, and Madurai. Contact your Tour Planner here.